Doctors trained in countries like India are suffering from an inherent bias within the UK medical system, a new report has indicated. An analysis of the UK’s General Medical Council (GMC) data between 1996 and 2013 revealed that Indian doctors were five times more likely to undergo “performance assessments within the state-funded National Health Service (NHS). The research conducted by University College London (UCL) and published in ‘BMC Medical Education’ journal recently concluded that doctors trained outside the UK had significantly higher rates of GMC performance assessments than UK-trained doctors. “Bias within the system, particularly in terms of who is complained about, could be and probably is a factor. But I suspect it is not the only factor. We have raised these issues and we think more research is needed to tease apart different explanatory factors,” said Dr Henry Potts, the lead author of the research. “There may be implications for transnational agreements on freedom of movement of healthcare professionals, and for what testing is required by national governments of individuals trained elsewhere,” the report said. Susan Goldsmith, Deputy Chief Executive of the General Medical Council, said: “We believe doctors and patients are best served by bringing in a single route to UK practice, replacing the multiple routes that exist now. “There is no doubt that there is an inherent problem within the system. BAPIO has always spoken up for fairness and equality. 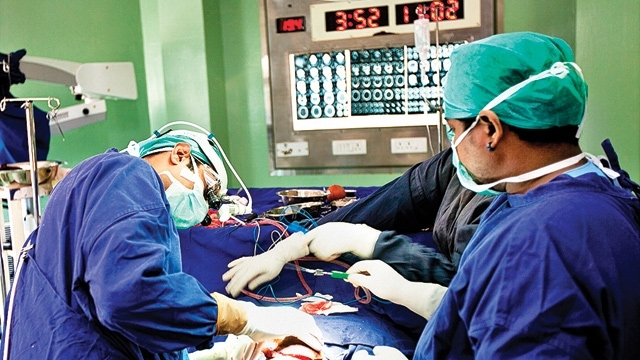 We are very proud of the services given by Indian doctors and while we do believe things are gradually improving, we are still concerned there continues to be differential treatment,” said BAPIO president Dr Ramesh Mehta. “In all our meetings with ministers, it is very clear that Indian doctors are considered the backbone of the NHS. They have approached us to help recruit more Indian doctors and we are working on this fellowship programme which will see the NHS get doctors from India to fill shortages and Indian doctors get the excellent British training. We want to ensure it is not a brain drain from India but a win-win situation,” Dr Mehta explained. “Health Education England (HEE) through its Global Health Exchange is pleased to be helping to support the training and development of overseas doctors by placing them in clinical educational programmes in hospitals in the UK,” said Ged Byrne, Director of Education and Quality, HEE – North West. “This work is helping to increase the number of doctors who are available to support acutely ill patients. The relationship benefits both the UK as it helps to fill an immediate need and the doctors themselves who gain access to high quality training and a unique skills set,” he said.